Every 25 seconds, firefighters respond to a fire in the United States. The National Fire Protection Association reports seven people die each day from home fires. Don't let you or your loved ones be one of those statistics. Make sure you have working smoke alarms in your home today. Smoke alarms in homes save lives. Your risk of dying from a home fire is cut in half if you have a working home smoke alarm in your house. In 2015 over 2,500 people lost their lives in a home fire. Three out of five deaths from a home fire result because the home does not have a smoke alarm or the smoke alarm is not working. Smoke alarms should be installed on every floor of the house, including the basement and all the bedrooms. About one-third of all house fires start in the bedroom. Fires can start from anything, but one of the most common causes of house fires is candles. Between 2007 and 2011, candles started over 10,600 fires in the United States that caused 115 deaths, 903 injuries, and over $418 million in damages. Not only can smoke alarms save lives and your stuff, they can also save you money. Many insurance companies offer a five percent discount for homes with smoke alarms. A $15 investment can save you lots of money in the future. Not all fires burn the same. Some flare, while others smolder. 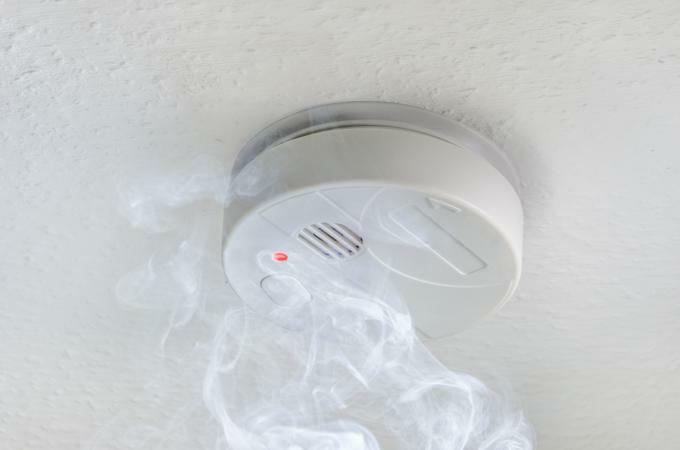 You'll want a home smoke alarm that can detect both types of fire. There are currently three types of smoke alarms available. Ionization smoke alarms are most responsive to flaming fires. These types of smoke alarms have a tiny amount of a radioactive material between two electrically charged plates, which ionizes the air and causes an electrical current to to flow between the plates. If smoke is detected, the current in the plates is disrupted, causing the alarm to sound. Ionization alarms do not detect smoky, smoldering fires well, and they are prone to false alarms from burnt food and steam. To reduce chances of false alarms, avoid putting ionization smoke alarms near the kitchen or bathroom. The Kidde Battery-Operated Combination Smoke/Carbon Monoxide Alarm is one of the top ranked smoke alarms on the market. Not only does it detect smoke, but it can detect deadly carbon monoxide. The 2-in-1 voice alarm provides both voice alerts for "Fire" and "Warning! Carbon monoxide." Photoelectric smoke alarms are good at detecting smoky, smoldering fires, but not fast, flaming fires. Photoelectric smoke alarms work differently than ionization smoke alarms. They work by aiming a light source into a sensor chamber at an angle away from the sensor. When smoke enters the chamber, the light source is changed so it hits the sensor, activating the alarm. The Onelink Wi-Fi Smoke + Carbon Monoxide Alarm is a hard-wired photoelectric smoke and carbon monoxide alarm that connects to Apple products. This smart alarm can send alerts to your iPhone and has a 10-year sealed battery backup so you don't have to change the battery. A dual-sensor smoke alarm combines the technology of both an ionization smoke alarm and the photoelectric smoke alarms so you only need to install one type of smoke alarm in your home. Dual-sensor alarms are the best type of alarms as they can detect both kinds of fire, giving you more protection. The First Alert SA320CN Dual Sensor Battery-Powered Smoke and Fire Alarm is a dual-sensor ionization and photoelectric smoke alarm that detect both flaming and smoldering fires. The alarm is budget-friendly and operates on two AA batteries. Installing a smoke alarm is not difficult, and you only need a few tools and a ladder. It is important to remember to install smoke alarms at least 10 feet from any appliance, like the stove, that could set off a false alarm. Smoke alarms should be installed either on the ceiling or high on the wall. Installing a battery-powered home smoke alarm is easy. Just follow these simple steps, and you'll be done in about 10 minutes. Insert the 9V (or required) battery. Test the alarm by pushing the test button. Listen for the beep. Locate the spot on the ceiling you want to install the smoke alarm and use the mounting bracket to mark the holes for drilling with a pencil. Drill the holes and insert the anchor screws. Attach the mounting bracket to the ceiling with the anchor screws. Install the smoke alarm to the mounting bracket by giving it a small twist to lock it in place. Some smoke alarms are hard-wired. All hard-wired smoke alarms run off of electricity, although they have battery backup, and connect with each other. Since all hard-wired smoke alarms are connected, if one smoke alarm detects smoke, all the smoke alarms in the house will go off. Unfortunately, hard-wired smoke alarms must be professionally installed as they need to be connected to your home wiring. 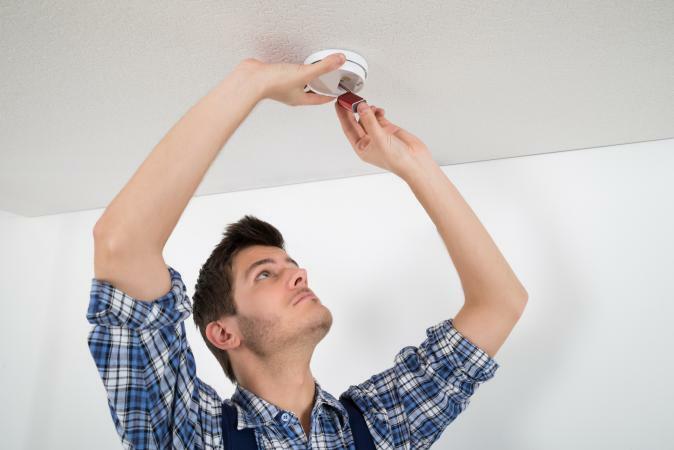 Smoke alarms are as easy to maintain as they are to install. Ensure all home alarms are properly installed and have batteries. Even hard-wired smoke alarms need batteries in case the power ever goes out. Follow the smoke alarm manufacturer's recommendation for battery replacement, but all batteries should be replaced yearly. Test each smoke alarm at least monthly. Before purchasing a smoke alarm, ensure it meets the Underwriters Laboratories Standard (UL). Just look for the UL stamp on the packaging. This mark ensures the product meets all the basic requirements to be a smoke alarm for the home. Additionally, check the manufacture date printed on the package. Devices lose their sensitivity over time, so the fresher the better. Replace smoke alarms in your home every 10 years. The most common problem people face with smoke alarms is dead batteries. According to the National Fire Protection Association (NFPA) as cited above, three out of every five home fire deaths occur because there are no smoke alarms in the home, or the batteries died or were missing. It is important to check your smoke alarms at least once month and replace batteries as needed. It can save your life! Approximately two-thirds of home fire deaths occur because of no or non-functioning smoke alarms. Don't put your family at risk. Make sure every floor and bedroom in your house has a home smoke alarm. Dual-sensor smoke alarms provide the most protection and are relatively cheap. A small investment now could potentially save your life in the future.